Our site is constantly growing and we find and add new great acts all the time. Please forgive us for not having the full list of act available in NSW at this time. 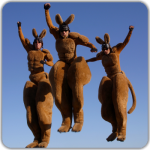 Jumping kangaroos with high energy and unlike anything you have seen before. At 2.7 metres in height, these jolly, playful Candy Canes spread X-mas cheer. A variation of the Giant Candy Canes, they are perfect for any Christmas themed event. 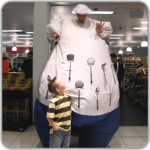 Giant chefs with a big appetite for fun, sure to liven up any event! Perfect for food and wine events, shopping centres and corporate functions.